2. 45°Double-blade angular sawing machine. 1. When the foot panel switch is pressed the machine will perform material clamping and cutting automatically 2. Cutting feed is driven by an air/hydraulic combination power for smooth feed speed. 3. Vertical and horizontal workpiece clamping design ensures extremely firm for any type of aluminum workpiece 4. Work piece clamping pressure is adjustable to eliminate material deformation problem. 5. 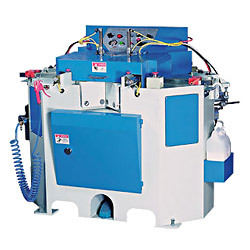 Automatic oil mist colling for sawblades provides burr-free surface of cut, while extending sawblade life. 6. Alternatively sawblades straight feed in horizontal direction allows large cutting width. 7. Equipped with wear-resistant linear motion guides for accurate angle of cut. 8. Allows for right or left cutting individually. 9. Right and left cutting alternatively fully eliminates waste of workpie, etc. 10. Cutting angle is easy to adjust. 11. Gap between gauge and sawblade is adjustable no burr after sawing. 12. Both side of the machine are equipped with a 2.4m infeed and a 2.4m outfeed conveyor table for convenient repetitive. 13. The machine performs a 45 degrees miter cut. Designed for high speed cutting of extrudes strip, door and window frames.